Lao She was born in a poor Manchu family, raised by his mother, attended the Normal School thanks to an uncle and became a teacher at 19 years old. In 1922, he was baptized and two years later obtained a position at the School of Oriental Studies, University of London under the auspices of the London Missionary Society (LMS). He is a successful professor of Chinese under the direct supervision of Reginald F. Johstone (2), the man who was the tutor of Pu Yi, the last emperor. He meets in London a few old Chinese friends and suffers from the climate and the English food. But he will share an apartment for three years with an amazing character, Clement Egerton, who became a friend. He will translate with him the great novel “Jin Ping Mei” but does not mention it considering the pornographic nature of some pages. 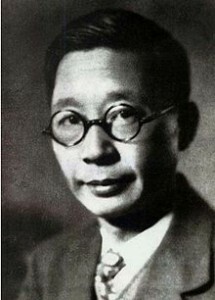 In London he wrote successively “The Philosophy of Lao Zhang” (also translated into French by Claude Payen) and Zhao Ziyue and in 1929 “Mr Ma and Son”. This book was also translated into English and published in Hong Kong in 1984. Curiously Anne Whitchard mentions only an unpublished translation which will be released at short notice by Penguin. “ Mr Ma …” is one of the good novels by Lao She, a rather ferocious satire of the English but also of some characters of the older Chinese generation. Reference should be made to a high quality essay, unfortunately very difficult to find, the translation by Paul Bady of “My literary experience” that Lao She published in 1937. This translation (PUF 1974) is accompanied by 80 pages by the translator concerning the biography of Lao She. He has a bad memory of the missionaries with whom he rubbed shoulders in China and who interfered too much to his opinion in the running of the Church. This will be remembered in the portrait of Rev. Evans: “He would always pray to God that China would soon become a colony of England. With fervent tears he said to God “If the Chinese are not administrated by the British, those yellow-faced, black haired creatures will never get to heaven, no matter what” (p.21). The book by Anne Witchard analyzes in a few pages the literary and political career of Lao She until his death by… suicide, “Lao She chose instead to go to Taiping Pond and drown himself” (p.135). Cannot believe that she did not have any knowledge of the controversy over the death of Lao She, and the statements by his wife who excluded the possibility of a suicide. Even Ba Jin, whose political prudence is known, wrote in 1979 that he still does not know if it is a suicide or a murder! Her comments on the journalist Thomas Burke and his “Tales of Chinatown,” which concerned the risk of corruption of the English nation by China, are very interesting. 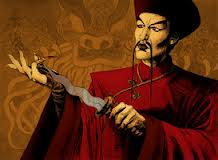 Like her analysis of the books by Sax Rohmer and his hero, Dr. Fu Manchu (4), a Chinese with an unusual intelligence and cruelty that threatens civilization! Then the film “Piccadilly” in 1929, reinforces the image of drug trafficking organized by the Chinese community. Chinese protests are many but who cares at the time! But during this period, the front edge of intellectuals in London and especially the Bloomsbury group showed great interest in China and its civilization. Poetry where the role of Ezra Pound is well known, Confucianism emphasized by Allen Upward, who also had a great influence on Ezra Pound. The impact of Chinese art, specially via Laurence Binyon, are also important. Even fashion draws inspiration from the East and China, the style of Paul Poiret in 1911 after Paris was adopted in London. Also in terms of decoration, China and “chinoiserie” are on the front line. 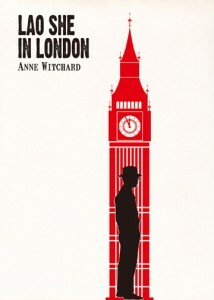 On all these topics, the book by Anne Witchard brings many elements and shows us that the four years in which he lived in London are an essential step in the career of a great writer. (1) Anne Witchard, “Lao She in London.” Hong Kong University Press. 2012, 170 pages. (2) Mentioned in the biography by Britt Towery “Lao She, China’s Master Storyteller.” The Tao Foundation, 1999. (3) Lao She, “Gentlemen Ma, father and son”, translated into French by Claude Payen, foreword by Paul Bady. Editions P. Picquier, 2000, 330 pages. (4) Three novels by Sax Rohmer were recently published in a new translation into French with Zulma Publisher. Amazing, novels to read on the beach … which are read with pleasure. “Mr Ma and Son”, translated by William Dolby with a foreword by Julia Lovell is released in August with the Penguin Modern Classics. The same publisher will release next month “Cat Country” by Lao She, translated by William A. Lyell with an introduction by Ian Johnson. Good news as this book was very difficult to find either in French or in English. This is not one of my favourites from a literary point of view, it is a science fiction novel, the only novel by Lao She which is clearly political and in this respect very interesting.